If enabled, the code will be valid for exactly 24 hours starting from June 3rd 00:00 AM EST. The price for .com, .net, or .org domains registration or transfer with Namecheap is $0.98*. 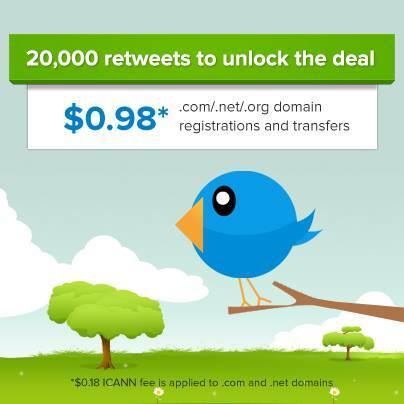 Please note that the $0.18 ICANN fee is applied to .com and .net domains. The offer is limited to 1 per household entity or business, and is not valid for domains that were transferred out of Namecheap earlier. Each domain registration or transfer comes with free WhoisGuard and free Personal Email for the first year. Please note that the overall number of domains at the promo price will be limited. You follow the guideline and not retweet more than once every 6 hours. Twitter accounts must NOT be protected so that we can see your retweet. Please follow @namecheap while participating. You can only retweet once every 6 hours. If you fail to follow this rule, these retweets won’t be counted. Additionally, accounts caught doing so might be disqualified from the promo. The retweets published after 11.59 PM EST on June 2nd, 2013 will not be taken into account.